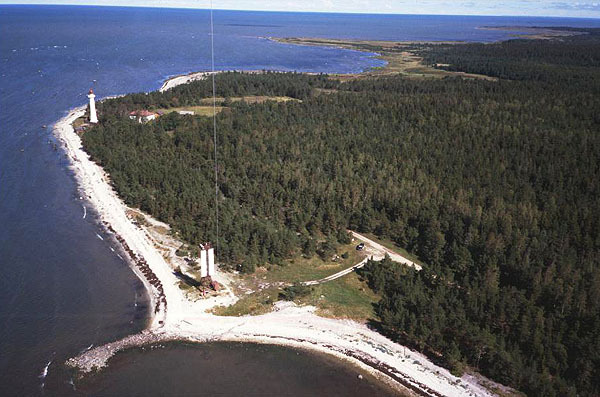 The island of Vormsi is located in northwestern Estonia. It faces the Gulf of Finland to the north and is surrounded on east, south and west sides by relatively shallow water of the coastal sea. Many of the place names end in "by" which is the Scandinavian word for town. 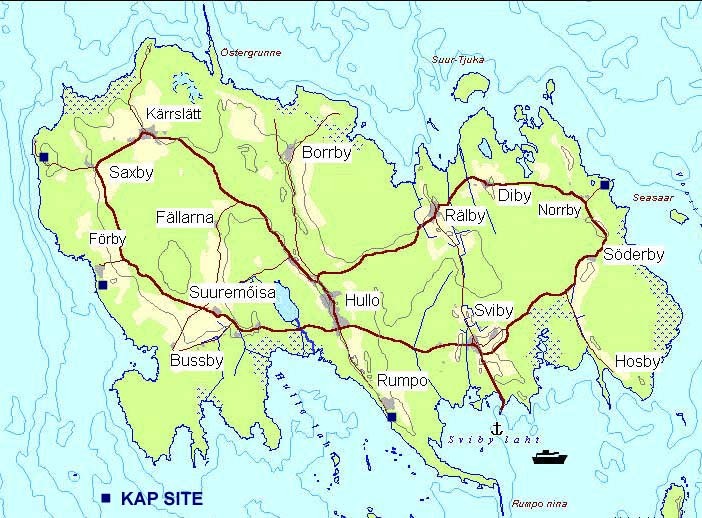 These place names reflect the Swedish history of the island, which was populated entirely by Swedes for several centuries. During World War II, most of the Swedes fled Russian occupation. They left on fishing boats in a mass exodus during the night. 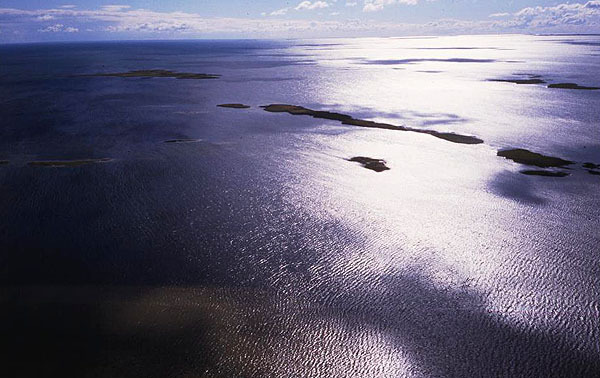 Vormsi is the fourth largest island in Estonia; it covers 93 km² (36 sq. miles) and is less than 20 m above sea level. 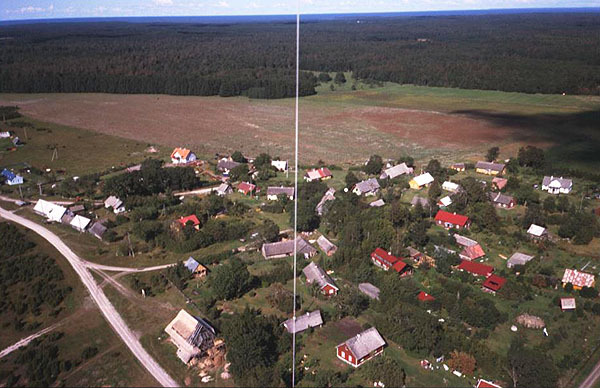 The island is covered by a patchwork of forest, agricultural fields, and small villages. It is a popular summer vacation site for nature lovers. During a stay of several days in August, 2000, we conducted KAP at four sites under nearly ideal conditions--consistent sea breeze and mostly sunny sky. Click on the site map below to see selected kite aerial photographs. Map obtained from Vormsi Info. 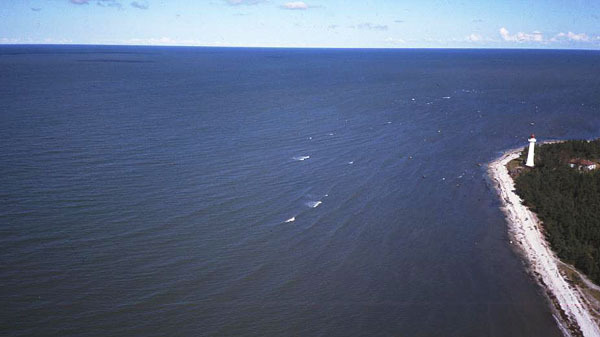 View off the northwestern side of Vormsi showing waves breaking on the shallow sea floor. 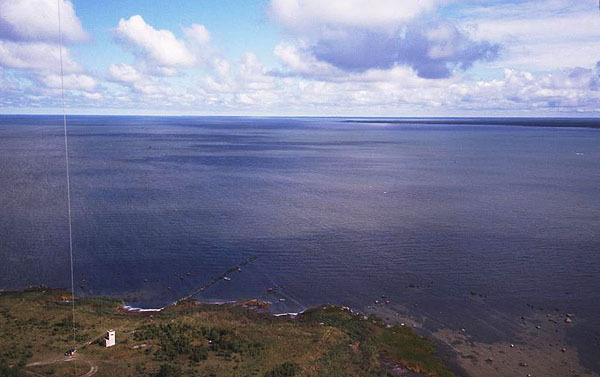 This side of the island receives waves from the Gulf of Finland. The coast here is made of limestone bedrock, and many glacial boulders are scattered along the shore line. Photo date 8/00, © J.S. Aber. The lighthouse and headland of northwestern Vormsi. Inland from the rocky beach, a spruce forest covers the landscape. The kite flyers are situated at the nagivation tower in the lower part of view. Photo date 8/00, © J.S. Aber. 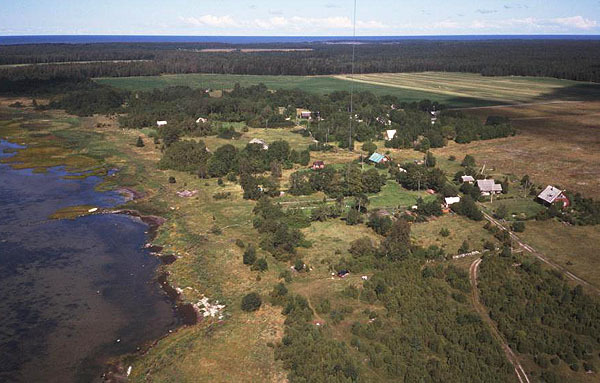 Förby is a small summer vacation community on the southwestern coast of Vormsi. The coast here is protected from large waves as shown by its irregular shape and vegetated shore line. Photo date 8/00, © J.S. Aber. Low-oblique view of the shore and shallow sea floor at Förby. 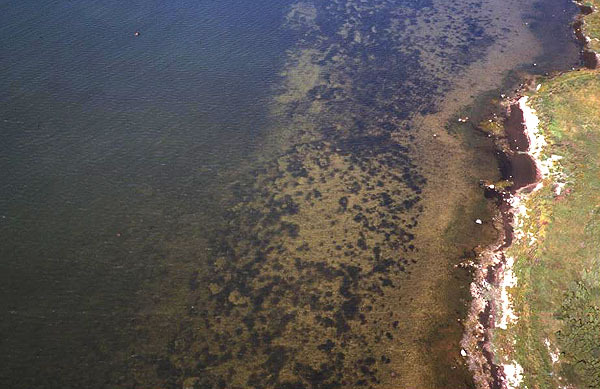 Note the pattern of aquatic vegetation on the sea floor (scene center). Photo date 8/00, © J.S. Aber. View toward the northeast from the coast at Norrby. A small lighthouse stands in the forest, and coastal marsh grows along the irregular shore line. Photo date 8/00, © J.S. Aber. 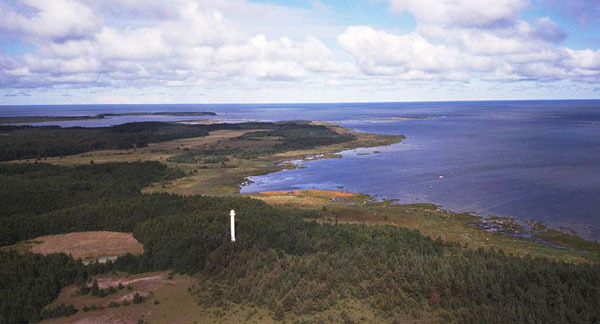 View eastward from Vormsi toward the mainland of Estonia (right distance). The small tower in lower left was formerly a military guard post. Interesting cloud reflections and shadows can be seen on the water surface along with small waves. Photo date 8/00, © J.S. Aber. The distinctive peninsula on the left is an esker--a ridge of sand and gravel deposited by a river beneath a glacier. The road follows the crest of the esker, which bends toward the east in the distance. 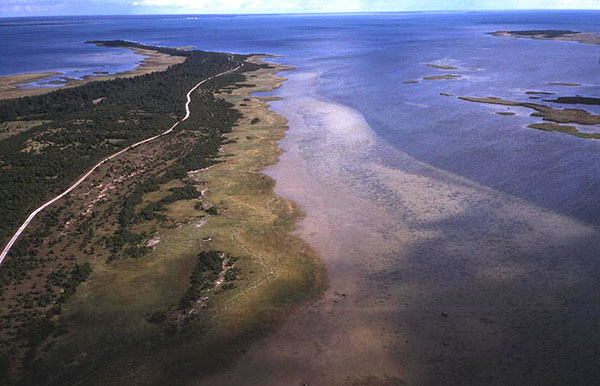 Most of the peninsula and surrounding sea are included in a nature preserve for migratory birds. Photo date 8/00, © J.S. Aber. Village of Rumpo is a vacation community located next to the nature preserve on the peninsula. The house at lower left of scene was getting a new thatched roof at the time of this picture. Photo date 8/00, © J.S. Aber. Sun glint view over the sea south of Vormsi. This view highlights tiny islands and wave patterns on the water surface. Photo date 8/00, © J.S. Aber. Go to KAP gallery or Great Plains KAP homepage. Last update 18 Oct. 2000.